A myoma is a fibroid tumor or a non-cancerous tumor. Myomectomy is a surgical procedure to remove myomas or fibroid tumors from the uterus. The uterus is not removed. Disclaimer: This blog is a personal blog. It is not administered by Philhealth. hi tanong ko lang po.. kailangan kasi operahan ang birthmark ng anak ko yung tinatawag na strawberry human juma.. magkano kaya ma avail ko sa philhealth? ako po ay isang ofw! Hi jennifer, that could be covered as outpatient day surgery. Find a surgeon that accepts Philhealth coverage for day surgery. Sorry I can’t find in the Case Rate list that specific type of surgery so I can’t give the amount of coverage. My ob-gyne was advice me to undergo hysteroscopy myomectomy procedure at may iinject sia skin n para hindi ako magregla for almost 2 months that be covered by philhealth? Hi joy, the procedure is covered, but I’m not sure if the medication to be injected can be covered because that’s outpatient medication. Ask your ob-gyne. Hi Ms. Nora, my mom is admitted due to her myoma and anemia. She was transfused 3 bags of blood. Now she will be scheduled for an operation for her myoma, is it still covers the philhealth benefits? How much? Hi malou, the usual coverage is 12,600. See above for coverages for other types. Talk to your surgeon about costs so you can prepare. good day. just want to ask. my mom had myoma when she gave birth to my kuya (1993). and then, 5 months ago, she said her myoma returned after many years as she noticed her bleeding is continuous. she’s now so thin. is my mom’s case severe? Is surgery the option? What’s the preferred type? vaginal or abdominal? want less risk. I’m afraid for her. please help. any recommendations who can i ask about this situation. Thank you and Godbless. Hi Floralyn, yes, both are covered. If not contrary to doctor’s advice and if not more costly, have them treated separately, as usually only one case will be covered if treated together in one confinement. Obviously, of course, have the more serious one treated first. We can use Philhealth as many times as needed, up to these limits: only 45 days of confinement allowance per year; another set of 45 days per year for all dependents; if the same illness for the same patient within 90 days, only one confinement is covered. Exceptions to the 90-day rule are hemodialysis and chemotherapy. Hi my mother was confine last jan 15 2015 with anemia and we used her philhealth. Now after the ultrasound we found out that she had myoma. Her ob said she should undergo surgery asap. So could we use her philhealth again? Hi Sheila, yes, because anemia and myoma are different illnesses. Hi! just wanna ask if I will undergo ovary removal during my cesarean section, what case rate will be covered? or will it be 2 case rates?! Hi ed, your sister can consult with other OBs in other hospitals if it’s not emergency and if not yet scheduled. You can ask around for referrals. Hi lilian, yes, it’s covered. See the coverage amount above. Hi meg, baka yong myomectomy na 18k coverage ang naperform sa iyo, kasi ang sabi niya same as CS. You can see how much Philhealth really paid the hospital in your benefit payment notice that will be mailed to you by Philhealth. Or you can ask at any Philhealth branch maybe after a month. 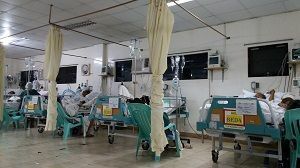 Pero kung anuman, usual practice na nila na bukod sa cash na ibinibigay sa OB as PF without OR, kukunin pa nila yong PF from Philhealth. Para daw sa assistants, etc. or other costs. Hindi kasi regulated ang PFs, so kahit ano ang idictate ng doctor, yon ang masusunod, wala silang limit, which is so frustrating. Pero you can try to ask for refund from the hospital if you have your notice.